Taipei – In the north of Taiwan the ChinPaoSan Necropolis cemetery is being extended by the construction of two impressive buildings - an arrival hall and a pavilion. Along with many urn tombs, in future the cemetery will also feature hotel, auditorium, museums and amphitheatre. The most notable architectural element is the Oceanic Pavilion, which combines pools of water with monumental, half cutaway spherical surfaces. 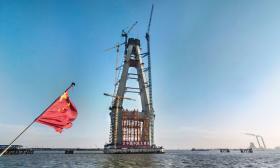 Nantong – In China's Jiangsu Province, north of Shanghai, work is in progress on what will be the world's biggest cable-stayed bridge, the Shanghai-Nantong Yangtze River Bridge. As well as the world's longest span (1092 metres), it will also have the tallest pylons at 325 metres. Doka automatic climbing formwork SKE100 plus is being used in combination with Large-area formwork Top 50 to construct the pylons. Thank you for your interest - Newsroom. Thank you very much for your interest - Newsroom.